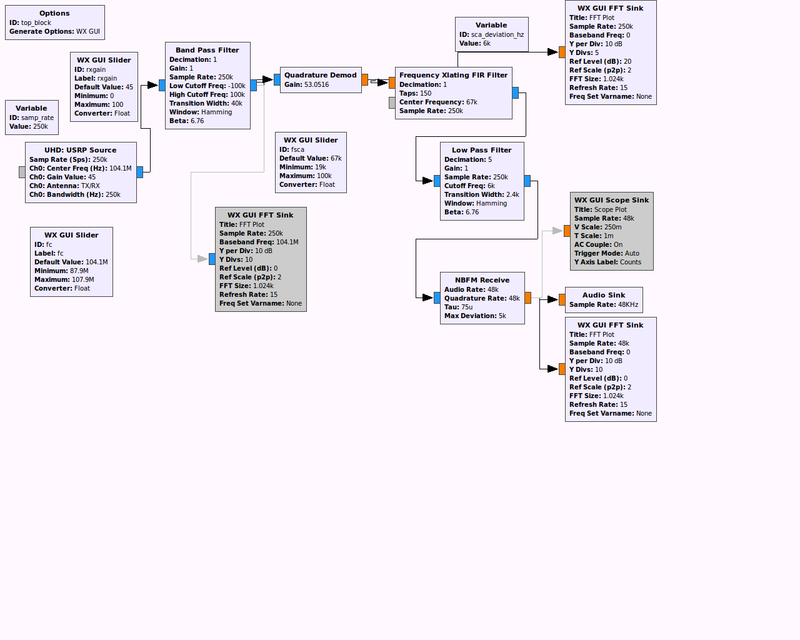 Decoding FM subcarrier SCA with GNURadio | Michael Hirsch, Ph.D.
Decode SCA broadcast in the 88-108 MHz VHF FM broadcast band with GNU Radio Companion WBFM_SCA.grc along with numerous other GNU Radio examples. This article explains SCA decoding as well as modern uses of spectrum adjacent to the main stereo VHF FM broadcast band signal. How does SCA decoding work? Consider the baseband FM diagram below. Do not confuse the abscissa with RF spectrum–this is baseband spectrum that is FM modulated before being transmitted on air. Unfortunately even some technically-oriented websites get this basic and critical fact wrong. Plain monaural broadcast FM as used prior to 1955⁄1961, and used wisely by some talk stations today instead of stereo to improve geographic coverage area by reduction of multipath interference, is frequency modulated audio from 50 Hz - 15 kHz. FM multiplexing was employed in the early FM experiments by Armstrong, back to Nov. 1934 to send additional audio channels, faxes, etc. and SCA became generally legal for broadcasters in 1955. The April 1961 selection of the GE/Zenith FM stereo system placed a 19 kHz stereo pilot, high enough above legacy monaural receivers low-pass filter response to not bother them. Of course, circuitry and speakers available in June 1961 along with human hearing response would render the 19 kHz pilot inaudible in any use case. WBFM baseband spectra with SCA, RDS, stereo elements. bandpass filter say ± 180 kHz before FM demodulation, to block adjacent stations while not making too much distortion. Remember the infinite sidebands of FM–don’t just clip to ± 75 kHz, it will sound badly distorted. OK to decimate down to 480 ks/s. plain FM demodulation (differentiator) – do not use de-emphasis at this point. frequency translate and low-pass filter SCA carrier e.g. -67 kHz shift, then low-pass filter 10 kHz or so. A normal baseband audio signal is emitted, if one was broadcast at this SCA frequency. A DAB+ smartphone: LG Stylus 2 K520 finally arrived in 2016, but like analog FM receivers in smartphones, requires headphones to be plugged in for the antenna. If HD Radio could likewise be brought to smartphones, this would be helpful–but there’s challenge enough getting carriers and Apple to enable the analog FM chips. Unlike the partially forced shutdown of analog FM in Europe, due to the different economy for Europe vs. North America, I foresee a continued gradual transition to digital AM/FM. A key question is when will AM/FM stations start to go full digital? Will it be in 5 years or 10 years? I think the first full digital HD Radio AM/FM station could occur in 7-10 years as I also foresee a massive turnover to electric and hybrid automobiles. These automobiles should include HD Radio receivers. too-high expectation of digital only coverage from -20 dBc. Mitigated by move to -14 dBc for most cases.